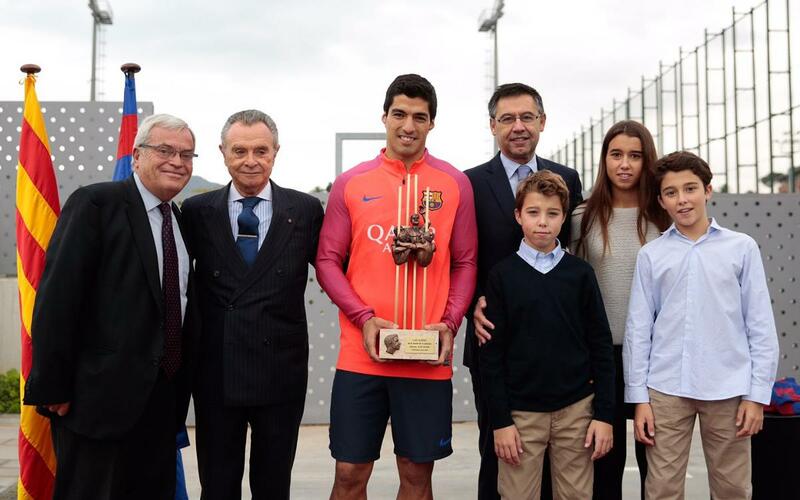 Thursday was a busy morning for Luis Suárez, because before collecting the Golden Shoe award as Europe’s leading domestic goalscorer of last term, he also collected the Memorial Aldo Rovira award as the Barça player of the 2015/16 season, as decided by a jury of directors and sports editors from the Catalan media. The event was attended, among others by president Josep Maria Bartomeu, sculptress Montserrat Garcia Rius and María Dolores Pardo, the widow of Aldo Rovira, after whom the trophy is named. The award was created in 2010 in memory of the son of FC Barcelona director Josep Lluís Rovira, who had died in a car accident the year before. Lionel Messi has collected the award no fewer than four times since its inception, while the other previous recipients have been Javier Mascherano and Éric Abidal.